today we proudly present two new features! 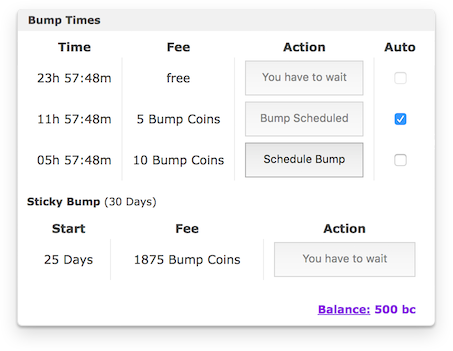 The bump addon now has a schedule and the long-awaited auto bump function which you can use to have your bumps completely automated. To activate these functions open the bump menu as usual via the bump button in your thread. You'll see a new column called "Auto" there. By ticking the checkbox you activate the auto bumps of the respective bump interval (free bumps excluded, the example image shows an auto bump every 12 hours). An active auto bump will bump your thread at the next possible bump interval until your bump coins are used up. You will be charged the same amount of bump coins you would pay for a normal bump. If you just want to schedule your next bump once you can do so by clicking the "Schedule Bump" button. With these two much-anticipated features the bump addon is finally complete and should make every trader's heart beat faster. You can report any errors as usual here in the thread or in the Complaint Area, have fun!